New colors enliven the 2014 MX-5 Miata. Buyers can choose Jet Black, Zeal Red, or Meteor Gray paint this year, depending on the trim level selected. A redesigned 2016 Miata will debut at the 2015 Chicago Auto Show, 26 years after the original. Mazda sells the 2014 MX-5 Miata in Sport, Club, and Grand Touring trim levels. The Sport model is offered only with a soft vinyl convertible top. The Club and Grand Touring models come with a fabric top or a power retractable hardtop. The MX-5 Miata Club is designed for driving enthusiasts, and is equipped with a 6-speed manual transmission, a sport suspension, a limited-slip rear differential, gunmetal-color 17-inch aluminum wheels, blacked-out exterior trim, slight body modifications, a racy side stripe, and a cloth convertible top. This version of the car isn’t without extras, though. Over the Sport model, it adds power door locks, remote keyless entry, cruise control, stereo controls on the steering wheel, a leather-wrapped shift knob, and a trip computer. The seats have red stitching, the seat back bars are dark gray in color, and the cabin has body-color trim. The Grand Touring model is upscale with leather seats, heated front seats, automatic climate control, an auto-dimming rearview mirror, a universal garage door opener, and a premium audio system. The Grand Touring sits on silver-painted 17-inch wheels in a unique design. A 167-horsepower, 2.0-liter 4-cylinder engine is the only one offered in the Miata, paired with a 5-speed manual gearbox in the Sport model and with a 6-speed manual gearbox in the Club and Grand Touring models. A 6-speed automatic with paddle shifters is optional, but the car’s horsepower rating drops to 158 ponies when it is installed. In addition to removing nearly 10 horsepower from the equation, the automatic transmission also returns the worst fuel economy. So equipped, the Miata gets 23 mpg in combined driving. Sport models with a manual transmission are rated to get 25 mpg, while the 6-speed manual delivers 24 mpg. 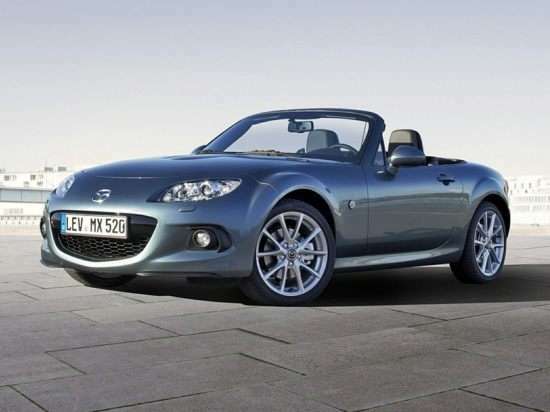 The 2014 Mazda MX-5 Miata has not been crash-tested, and neither is it likely to be, given its low sales numbers and the fact that it is reaching the end of its current lifespan. It weighs about 2,600 pounds, which bodes poorly if something larger crashes into it. But then, you could have guessed that, eh? Because the MX-5 Miata is designed to be as simple, as light, and as joyful to drive as possible, it is not a technology powerhouse. Mazda does offer a handful of modern features for the Grand Touring model in the form of standard automatic climate control, a universal garage door opener, and a Bose AudioPilot premium sound system. Options for the Grand Touring include Bluetooth connectivity and a keyless passive entry system with push-button starting. Satellite radio is offered for all models at extra cost.